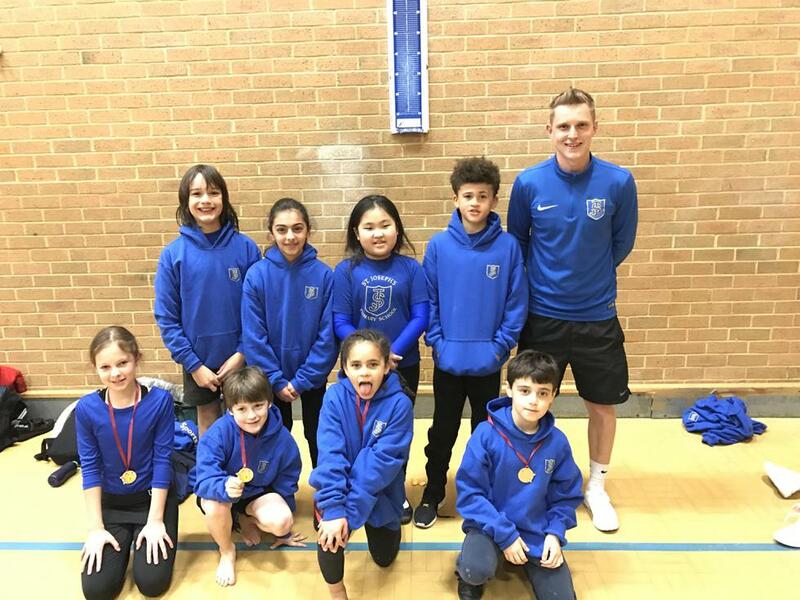 On Tuesday 14th March, the year 4 gymnastics squad made St Joseph's history by winning our 1st ever gymnastics medal in a borough competition. The key steps 2 team consisting of Savannah, Zofia, Christopher and Oliver have been working so hard leading up to the competition. Last year the team came a very respectable 5th place and Mr Ford saw the potential back then. After endless amounts of 8 am training the teams hard-work finally paid off as they finished the event with an impressive team score of 113.7 picking up the bronze medal. The event is made up 3 strands of gymnastics floor routine, vault and body management. The teams vaulting was very impressive with every team member scoring over 9.5 for their vault attempts. The competition is huge within the Kingston Borough and has 18 different primary schools taking part, as a 1 form school this achievement is exceptional and as a school we should be very proud of our amazing gymnasts. The key steps 3 team also took part in the borough comp and came 14th place against some very tough opposition. Well done to all and thank you to parents for supporting their children with training and competition. We have had 3 5 6 5 8 visitors!